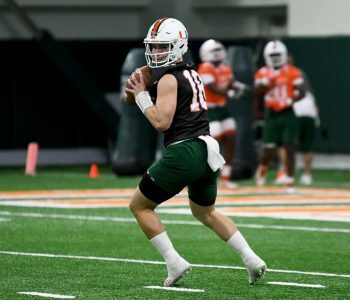 Men’s basketball Head Coach Jim Larrañaga and junior quarterback Brad Kaaya have both been officially tapped into the Iron Arrow Honor Society. 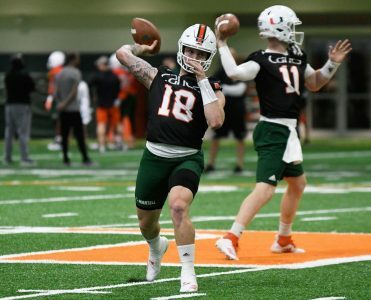 Larrañaga received the honor following shootaround on Wednesday, while Kaaya was tapped in on Thursday afternoon after practice. Being a part of the Iron Arrow Society is the highest honor one can achieve at UM, and it recognizes individuals at the university who passionately show five qualities based on the Seminole Indian tradition: love of alma mater, character, leadership, scholarship and humility. Larrañaga and Kaaya will participate in exclusive Iron Arrow events and each have the ability to nominate a person who they feel has the qualities to be included in the Iron Arrow Society. 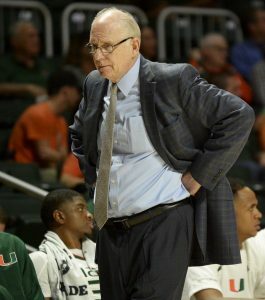 Larrañaga has led the Hurricanes to two NCAA Tournament Sweet Sixteen appearances and one ACC Championship title in his five years at Miami. Kaaya currently ranks in the Miami all-time top five in passing yards, passing touchdowns, completions, attempts and total yards.